Most Americans are familiar with the Metropolitan Opera in New York City, the largest classical musical organization on our continent, but not many know about the Metropolitan Opera House that once resided in Philadelphia, Pennsylvania. Before this historic opera house was bought by the Metropolitan Opera, it was known as the Philadelphia Opera House. It was built in 1908 by impresario Oscar Hammerstein I, who wanted a home for his new opera company. Even though the Philadelphia Opera Company did not last, the legacy of Hammerstein and his passion for opera lives on- hovering on the corner of Broad and Poplar Streets. In the early 1860s, fifteen-year-old Oscar Hammerstein left his home in Berlin, Germany and came to America. He arrived in New York virtually penniless at the time of the Civil War. Despite the labor shortage, he quickly found a job working at a cigar factory. He went on to become a well-known businessman after inventing a unique cigar-making machine. The fortune he made as a cigar manufacturer allowed him to pursue his true dream and ambition—opera. Hammerstein hired architect William H. McElfatrick to design the Philadelphia Opera House. 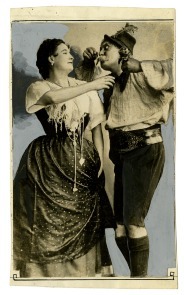 The Opera House opened the following November 17th, debuting with the French opera Carmen. It was a brilliant opening night, with every one of the 4,100 seats in the house occupied and almost 2,000 people standing behind the seats and in the aisles. Cleofonte Campanini, an Italian conductor who worked for Hammerstein, told reporters that the new theater was “the most beautiful opera house in the world,” and many agreed. Despite Hammerstein’s initial success with the Philadelphia Opera House, he soon started to struggle to make ends meet. The Opera House was much too big, and there was a small likelihood that it would be filled often enough to secure it forever. Philadelphia already had two nights a week of opera from the Metropolitan and Hammerstein’s house gave five shows a week. The city did not need that much opera. Hammerstein ended up having to sell his theater in 1910 to the very organization he tried to bring down- the Metropolitan. 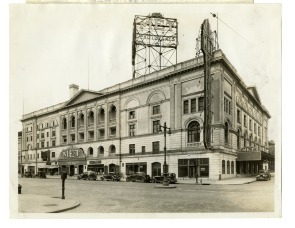 The Metropolitan used the opera house throughout the 1920s, along with various other opera companies. 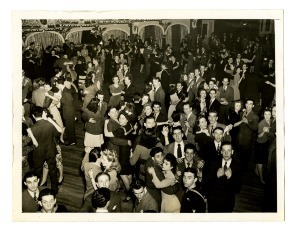 The building was also used as a ballroom for dances and galas, a movie theater, a sports venue, and most recently a church. As of 2013, it is home to the Holy Ghost Headquarters Revival Center at the Met, who is renovating the historic opera house. Although a passer-by may not even glance at what was once claimed “the most beautiful opera house in the world”, it still stands, honoring the memory of a man who lived his wildest dream. PHILADELPHIA MAY HAVE AN OPERA HOUSE. (1907, Apr 10). New York Times (1857-1922). PHILADELPHIA OPERA HOUSE UNDER HAMMER. (1920, Apr 30). Los Angeles Times (1886-1922).